Abtech SX Stainless Steel and Mild Steel Enclosures cover 14 sizes. These Abtech Junction Boxes are available in 11 sizes with depths of 140 or 200mm and 8 sizes which are available in depths of 140, 200 or 300mm. Most of the Abtech SX Enclosures can be fitted with removable gland plates on some or all of the four sizes. Abtech SX Enclosures also feature a hinged, lift-off door, which is fixed to the enclosure using at least 4 captive stainless steel screws which also maintain the correct compression on the gasket. The hinges of the door are solid block, machined oversize enabling the screws to control door closure, rather than the hinge, leaving its only function to support the door when opened. The hinges facilitate simple removal of the door and minimal opening is required prior to removal (less than 10 degrees). Abtech SX Hazard Area Enclosures can be supplied with a number of certificates. ATEX EEx‘e’ to BS EN 50019 (Zone 1 & 2) EEx‘nA’ to BS EN50021 (Zone 2) and NEMA 4X (CSA, UL & FM class 1, div 2) and GOST. Abtech SX Hazard Area Enclosures can be supplied fitted with any component approved terminal to apparatus level or can be supplied empty as component approved for the clients own certification requirements. Please contact us for further details. Abtech SX Enclosures were specifically designed to meet the rigours of the North Sea environment and are capable of achieving IP66 and IP67. In addition the SX Enclosure has passed the Shell/ERA deluge test which was designed to properly test enclosures and electrical equipment which is routinely subjected to conditions on ship decks or from fire deluge systems. 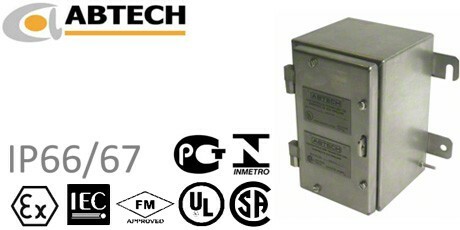 IP68 enclosures also available which are suitable for depths up to 120 ft (Please contact us for details). Further information on submersible enclosures is available (Please see the relevant section on this site). SX Enclosures are suitable for ambient temperatures of - 40°C to + 80°C (-40°F to +176°F) when fitted with a standard neoprene gasket. As an alternative the temperature range can be increased to - 70°C to + 130°C (-94°F to +266°F) when the Enclosures are fitted with an optional silicone gasket. When the Abtech SX Enclosures are fitted with ceramic terminals they meet the requirements of IEC 331 (750°C (1382°F) for 3 hours) and also BS6387/1983 (950°C (1742°F) for 3 hours ). Further details are available in our Fire Rated Enclosures section on this site. Abtech MSX Enclosures are produced in mild steel and are offered with a number of paint options including the majority of RAL colours and also anti-corrosion finishes. Please contact us for further details of the various paint finishes available in the range. Earthing is accomplished for the Abtech SX Enclosure Range using an Internal, external earth stud which is fitted as standard and can be connected to the terminal mounting rail or component mounting plate. Earth studs can also be fitted to the door and gland plates (optional). Earth Terminals (Rail mounted) or proprietary earth bars can be fitted inside the SX enclosure. The SX range has many features which lend itself to a wide variety applications, not least of which is the ability to be constructed to almost any dimension due to its fabricated nature. This can also be applied to EEx‘e’ enclosures where the certification allows oversize enclosures to be manufactured whilst retaining the next smallest sized enclosure’s power rating. Options for the SX Range include both hazardous area and industrial junction boxes, OEM installations, fire protection systems, tunnel wiring, IP68 applications, etc.